Global equity markets have sold off sharply in October, with the S&P 500 and the Dow Jones posting their biggest daily declines since February, while the CBOE Volatility Index (VIX) has surged. Amidst the risk-off environment, AGF Global Dividend has achieved first quartile performance over the past week, month and 3-month periods. There are several reasons supporting October’s returns and we are hopeful these trends continue. An important driver in October has been the reversal in risk factors, and specifically the portfolio’s underweight to momentum-driven stocks, which has weighed on returns for over a year now. This reversal has coincided with meaningfully higher U.S. bond yields, which has pressured high growth and high beta stocks where valuations had become too expensive. In this environment, not holding the FAANGs (Facebook, Amazon, Apple, Netflix and Google, or Alphabet) has added 12 bps this month. This may seem inconsequential but not holding these stocks had previously detracted approximately 150 basis points this year to September 30, 2018, and thus, a reversal of this trend could indicate an inflection point for performance going forward. Additionally, an overweight to value has also positively impacted returns in this environment. From a sector perspective, the current market selloff has been driven by Information Technology and Consumer Discretionary, the two sectors that had led the rally this year to the end of September, and two sectors that the portfolio remains underweight. The more defensive sectors in October have outperformed, including Consumer Staples, where the portfolio maintains overweight. This highlights the portfolio’s more defensive positioning and underscores our investment process, which focuses on high-quality companies through the lens of economic value added (EVA). A direct result of this is the strategy’s superior downside protection historically and what we are once again witnessing in the current sell-off. More defensive stocks such as Waste Management Inc. and tobacco stocks Altria Group Inc. and Philip Morris International Inc. have been top contributors this month. For a long time, we have stressed the many benefits of owning AGF Global Dividend, which notably includes its superior downside protection in down markets (see below for past instances of down markets). As markets continue to digest the market sell-off and have to deal with ongoing concerns around the impact of rising interest rates, trade tensions and their impact on corporate profits and valuations, we anticipate uncertainty and volatility to remain elevated. However, with the global economy still expected to remain relatively healthy and fundamentals supportive in select countries, we remain constructive on global equity markets. 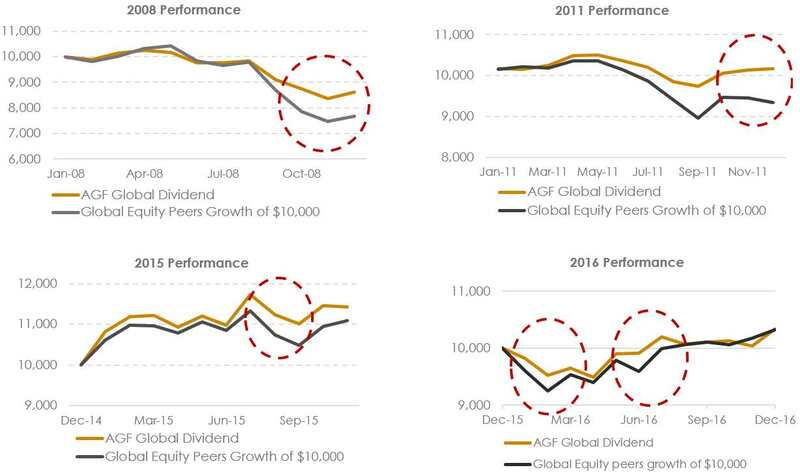 Consequently, following the sell-off in equity markets, and given the riskier environment going forward, now is a great time to be invested in AGF Global Dividend. The commentaries contained herein are provided as a general source of information based on information available as of October 12, 2018, and should not be considered as personal investment advice or an offer or solicitation to buy and/or sell securities. Every effort has been made to ensure accuracy in these commentaries at the time of publication; however, accuracy cannot be guaranteed. Market conditions may change and the manager accepts no responsibility for individual investment decisions arising from the use of or reliance on the information contained herein. Any financial projections are based on the opinions of the portfolio managers and should not be considered as a forecast. The forward-looking statements and opinions may be affected by changing economic circumstances and are subject to a number of uncertainties that may cause actual results to differ materially from those contemplated in the forward-looking statements. The information contained in this commentary is designed to provide you with general information related to investment alternatives and strategies and is not intended to be comprehensive investment advice applicable to the circumstances of the individual. We strongly recommend you consult with a financial advisor prior to making any investment decisions.